The sweetest, fruity, chewy treat! HI-CHEW™ comes in the perfect go-anywhere, do-anything 10-piece stick pack. It easily fits in your pocket or purse, so you’ll always have your favorite flavor handy wherever you go. Flavors include Strawberry, Green Apple, Mango, Grape, Banana, Kiwi and Acai. Peg bags are ideal for a variety of HI-CHEW™ flavors. HI-CHEW™ Original Mix includes classic favorites such as Strawberry, Green Apple and Grape. HI-CHEW™ Tropical Mix offers an exotic twist of Mango, Pineapple and Kiwi. HI-CHEW™ Sours Citrus Mix comes in Grapefruit, Lemon and Lime. HI-CHEW™ Fizzies takes two nostalgic flavors, Cola and Orange Soda, and infuses them into HI-CHEW’s long-lasting, sensationally chewy pieces. What could be better than a bag full of your favorite HI-CHEW™ flavors? The Stand Up Bags offer even more individually wrapped pieces for the true HI-CHEW™ fanatic. The new HI-CHEW™ Original Mix includes classic flavor favorites Strawberry, Green Apple and Grape, with the tropical addition of Mango. Now even more sour, HI-CHEW™ Sours Citrus Mix comes in three flavors including Grapefruit, Lemon and Lime. Are you a HI-CHEW™ fan? 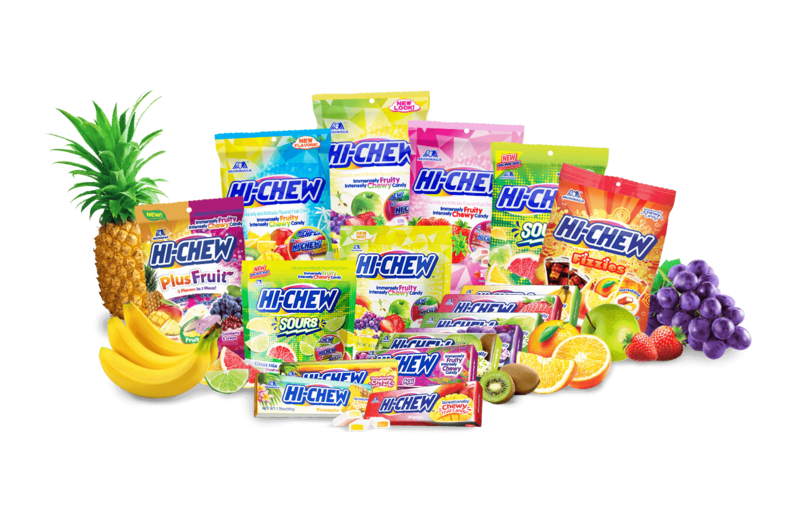 Check out our exclusive flavors, limited time and seasonal items and fun HI-CHEW™ swag. These items are unique and can’t always be found in stores. You can also learn how to win some of these items by signing up for our Chew Crew fan base!